If you are interested in learning more about the Unreal Engine 4 games engine you might be interested in a new video which has been released providing more details about the visual effect features and rendering techniques that are available within the Unreal Engine 4 games engine. 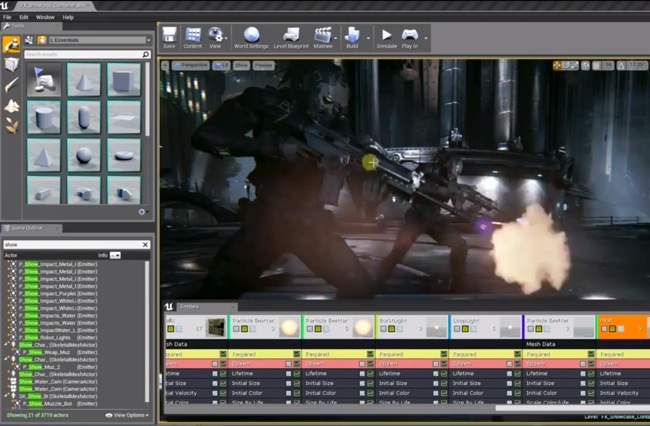 The video below demonstrates the mechanics that are in action creating the visuals for the Unreal Engine 4 and the visual effects in the Infiltrator Demo part 1 examines the Unreal Engine 4’s new visual effects pipeline. Demonstrating how the GPU particle simulation and collision, dynamic particle lights and other visual effects are used to ground the world and add richness to the environment in Epic’s Infiltrator real-time demonstration that has been built using the Unreal Engine 4. The Unreal Engine 4 demonstration video has been created by Epic engineers Tim Elek and Zak Parrish and more are expected to be created in the future revealing more of the features and tweaks that can be made to the Unreal Engine 4 to make your projects look more realistic and blow the socks off anyone that see them. The original demo can be seen below and was originally released back in April of this year by Epic together with the demo from Digitial Foundery showing the Unreal Engine 4 running in real-time on PlayStation 4. Enjoy!